7. Pay attention to your teeth, both how they look and how they feel. Let Dr. Richard Mullens and Dr. James Nguyen know if you see signs of discoloration or erosion, or feel tingling. Make an appointment at our Jacksonville, FL office if you feel tooth or gum pain when eating or drinking. Everyday life can take a toll on the whiteness of our teeth: Foods we love as well as soft drinks and coffee can stain them over time. Poor brushing and flossing can also leave behind tooth stains. Even injuries to teeth or gums can cause some yellowing, and in certain cases, medicines can contribute to discoloration. 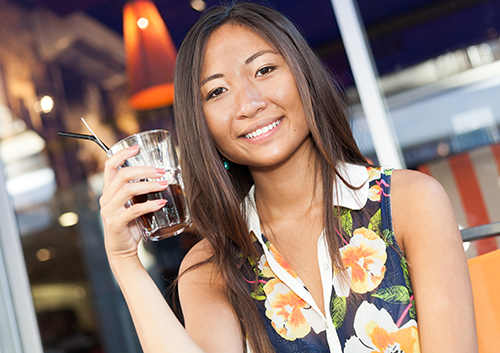 Drink through a straw or cut back on coffee and soft drinks to reduce risk of stains. Brush and floss every day. Try a whitening toothpaste or mouthwash. Visit our Jacksonville, FL office every six months for regular cleanings. We also offer in-office professional whitening at our Jacksonville, FL office. These whitening products are much more effective than whiteners you can buy at the store and are completely safe. Since they’re stronger, application by a member of our team is essential to achieve the best results. Still, some teeth can resist bleaching. If that’s the case, we can try several other techniques, such as deep bleaching that applies whitening agents over several visits, veneers and bonds that cover existing stains with a whiter, brighter surface, or laser whitening. If a whitening session is something you’d like to pursue, be careful about whom you trust to perform the procedure. Avoid using “bleaching stations” in shopping malls or at fairs. These so-called whitening techniques can irritate your teeth and gums, and leave them highly sensitive to pain. Also, operators of these whitening stands will make customers apply the bleach themselves, to avoid charges of practicing without a license. That should serve as a red flag and a caution to seek trained professionals like Dr. Richard Mullens and Dr. James Nguyen, instead. First word, first step, first haircut, first… toothbrush? While it may not be considered a typical milestone, choosing the right first toothbrush is an important first step in your child’s future dental health. The time to start brushing is when your baby’s first tooth appears. Until then, you have probably been using a clean, moist washcloth or gauze to carefully wipe your baby’s gums. Continue that gentle treatment with a toothbrush designed for infants. Look for a toothbrush designed especially for infants and toddlers, with extra-soft bristles and a small head for tiny mouths. 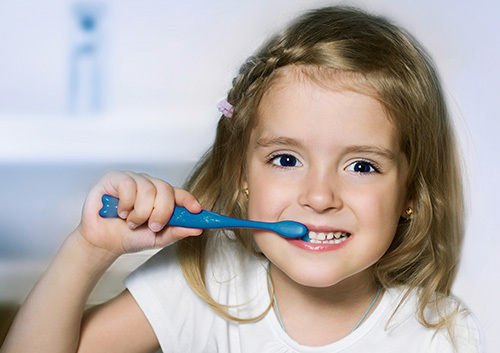 When your toddler is ready to try brushing for the first time, there are many options to make learning the proper technique enjoyable for both of you! Extra-soft bristles and small brush heads again are important for young children, and brushes are available with colorful patterns and designs to charm any child. There are brushes available with handles designed for easy gripping, right-handed and left-handed options, and even electric models. Don’t forget to schedule checkups every six months at our Jacksonville, FL office! You probably won’t be preserving your baby’s first toothbrush in your baby book, but teaching your child the proper way to brush with the right toothbrush can lead to a lifetime of dental health. And that’s a milestone to celebrate! More serious periodontal diseases, while relatively uncommon, can affect children and teens as well as adults. Aggressive periodontitis, for example, results in connective and bone tissue loss around the affected teeth, leading to loose teeth and even tooth loss. 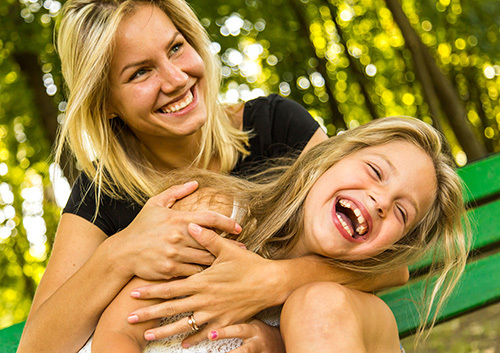 Let Dr. Richard Mullens and Dr. James Nguyen know if you have a family history of gum disease, as that might be a factor in your child’s dental health, and tell us if you have noticed any symptoms of gum disease. The best treatment for childhood gum disease is prevention. Careful brushing and flossing and regular visits to our Jacksonville, FL office for a professional cleaning will stop gingivitis from developing and from becoming a more serious form of gum disease. We will take care to look for any signs of gum problems, and have suggestions for you if your child is at greater risk for periodontitis. Together, we can encourage gentle and proactive gum care, and check off one more goal accomplished on your child’s path to lifelong dental health!